By practising Buddhist meditation we are able to change our minds. Our minds are how we experience the world. Everything which happens to us is filtered and made sense of by the mind. If we change our own minds then the world changes too. By changing ourselves we develop the qualities of awareness, kindness and wisdom. Mindfulness of Breathing: this helps us to develop a serene, alert, focussed state of mind, in which we can get beyond the usual chatter in our heads and start to listen to our deeper inspiration and wisdom. Metta Bhavana: sometimes called development of loving kindness – helps us to develop positivity and warmth, to leave behind harmful emotions, and to connect with other people seeing our common humanity. In Buddhism, meditation is seen as part of an overall path and approach to life. Meditation develops positive states of mind, but there is not much point in doing this for just a short period each day if we are cultivating negative states the rest of the time. For this reason we prefer to teach meditation along with a range of other practices that help us make positive changes to our mental states. 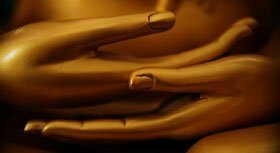 For this reason most of our introductory classes are called an Introduction to Meditation and Buddhism, rather than being just about meditation alone.